ENJOY 15% OFF WITH THE CODE IRIS UNTIL DEC 12. 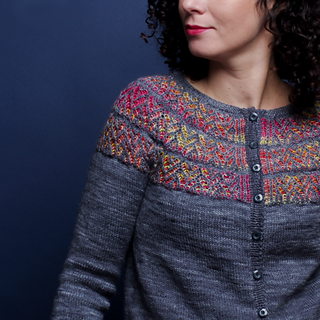 Iris is a circular yoke cardigan worked seamlessly from the top down. 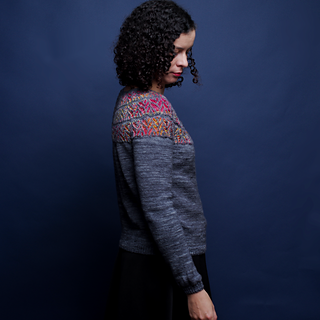 A two-color herringbone brioche motif with a bright contrasting color makes the yoke pop. Body and sleeves: size 3.5 mm US size 4: 60 cm 24″ and 80 cm 32″or magic loop method) circular needles. Ribbing and yoke in brioche: size 3 mm US size 2½: 60 cm 24″ and 80 cm 32″or magic loop method) circular needles. Markers; stitch holders or waste yarn; tapestry needle; ten 12 mm 1/2″ buttons. 26 sts and 34 rows = 10 cm 4″ in stockinette stitch on larger needle, after blocking. BENEFICIEZ DE 15% DE REDUCTION AVEC LE CODE IRIS JUSQU’AU 12 DECEMBRE. 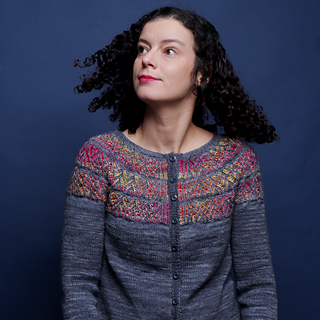 Iris est un gilet avec un empiècement circulaire tricoté de haut en bas sans couture. Un motif de chevron en point brioche bicolore avec une couleur pleine de peps fait ressortir l’empiècement. 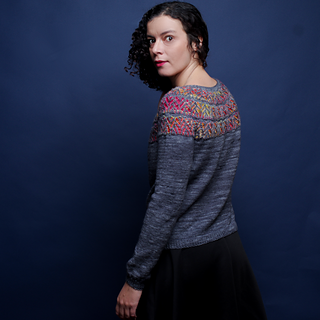 Le prototype a été tricoté en Treliz Hera (100% SW Merino High Twist) dans les couleurs Mine of Moria pour la CP et Cosmopolitan pour le CC. N’hésitez pas à ajuster la taille d’aiguille pour obtenir le bon échantillon.